October is breast cancer awareness month and a group of Canadian “babes” are doing their part to raise money for the cause. 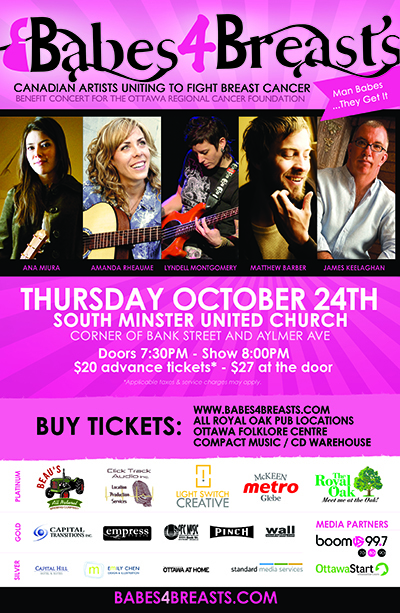 This year’s Babes4Breasts is a National Benefit Concert fundraising for a variety of Breast Cancer charities. The concert is taking place tomorrow, Thursday, October 24th at Southminster United Church. Doors open at 7:30pm and the show gets underway at 8pm. Five excellent performers will be tickling your ear drums as they sit on stage together in a song circle for this great cause. They are Ana Miura (organizer), Amanda Rheaume, Lyndell Montgomery, Matthew Barber and James Keelaghan. Tickets are only $20 in advance, and proceeds go to help find a cure to a disease that touches us all. Another of the great Babes4Breasts’s initiatives is the compilation album they recently released. The 15-song album features Rose Cousins, Jenn Grant, Oh Susanna with Jim Bryson, Amanda Rheaume, Matthew Barber, and many more. The wonderful mix of beautiful songs is available digitally on iTunes or can be ordered in physical format here. The CD will also be available at the show, for those looking to double up their contribution. Proceeds from the sale of these albums will go to a variety of breast cancer related charities including the Ottawa Regional Cancer Foundation, the Canadian Breast Cancer Foundation, the Canadian Cancer Society, and more. Babes4Breasts was built from a desire to do good and unite women across the country. Founder Ana Miura enlisted the help of many talented, female musicians (and male musicians) and has raised over $50,000 to date!